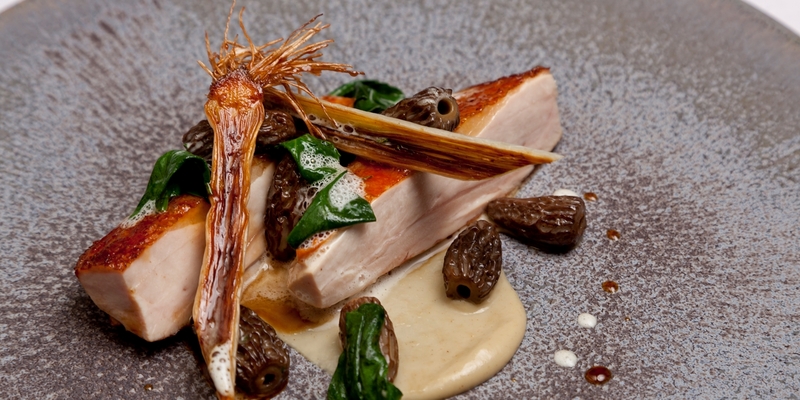 Marcus Eaves’ roast guinea fowl recipe produces an expertly poised dish. The meat is roasted on the bone and paired with a sweet and warming shallot purée, leeks enhanced with the flavour of liquorice and textural morels. The final dish only uses the breasts, so reserve the legs for soups, stews or salads. Begin by preparing the shallot purée. Slice the shallots and place them in a saucepan over a medium heat with the butter and a pinch of salt and sugar. Place a lid on top and leave to cook on a gentle heat for around 15-20 minutes, stirring occasionally. Once the shallots are completely soft, drain off the excess butter and pour in the double cream. Simmer gently for a further 5 minutes, then transfer to a blender and blitz until the purée is smooth. Preheat the oven to 180°C/gas mark 4. Stuff the cavity of the guinea fowl with the crushed garlic, rosemary and thyme. Truss the bird using butchers’ string to secure the cavity. Rub butter all over the skin of the bird and place in a roasting tin. Roast in the hot oven for 35 minutes, or until the leg juices run clear when pierced with a sharp knife. Meanwhile, prepare the braised leeks. Leaving the roots intact, trim a little off the tops and wash the leeks thoroughly in ice water to remove any soil or sand. Bring the chicken stock to the boil and add the thyme, liquorice root, garlic and a pinch of salt. In a separate pan, lightly caramelise the butter to make a beurre noisette. Add the butter to the stock and simmer for 5 minutes. Then, place the leeks in the stock and simmer until tender, approximately 15-20 minutes. Remove the leeks from the stock, cut them in half lengthways and drain on kitchen towel. Place a pan over a high heat and add some oil. Once scorching hot, caramelise the leeks until dark golden brown and set aside. Once the guinea fowl is cooked, remove from the oven and rest the bird upside down for approximately 25 minutes so that the juices relax back into the meat. Reserve any juices in the roasting tin. Wash the morels thoroughly in warm water to remove any soil or sand until completely clean. Preheat a frying pan and add the butter, garlic, thyme and morels. Lightly fry the morels until they start to soften. Remove the excess butter with a spoon or absorbent kitchen paper and glaze the mushrooms in a splash of chicken stock. Season to taste. In a separate pan, lightly sauté the spinach in a knob of butter, season and keep warm. Before serving, in separate pans reheat the shallot purée, leeks and morels. Spoon some of the purée onto each plate. Remove the breasts from the bird, carve each in half lengthways and arrange on top of the purée. Place the leeks and morels neatly around each plate and garnish with the baby spinach. Drizzle with the cooking juices and serve immediately. Eaves gained his first Michelin star at just 27-years-old – fourteen months after opening the doors of L’Autre Pied in 2007, in London’s Marylebone. After eight years as Head Chef at Pied a Terre, Marcus is pursuing his passion for local British produce in other ventures. 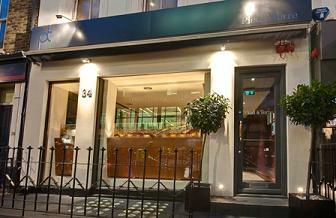 Michelin starred Pied a Terre is located in Fitzrovia, the heart of the West End. Since opening its doors in 1991, the restaurant has won some of the highest accolades possible and continues to impress diners with beautifully crafted culinary treats and Michelin star service. 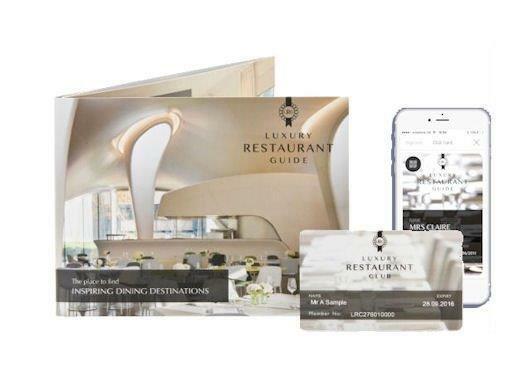 Club Offer: Member (and their dining party) receives a complimentary middle course between starter & main on a la carte menu when having lunch Monday to Friday and dinner Monday to Saturday. Click here for more details.